Environmental Justice is the concept that environmental pollution disproportionately affects the vulnerable in society that often do not contribute to the problem directly — women, children, the old — and this pollution, from landfills, incinerators, chemical plants, or polluting factories, is often deliberately placed into low income and minority areas, without the communities that are forced to bear the harm having a role in the decision-making process. No example illustrates the harm of environmental justice more than climate change — the mother of all collective action problems, also a game theoretic problem and prisoner’s dilemma — because when some countries, such as the US or Russia, fail to act to curb their GHG emissions, then other countries have less incentive to act. The issue is that nations such as Brazil, India, and China, are still considered developing countries, although they are experiencing rapid economic growth and have many affluent people. Thus, these countries insist that they must still be allowed to emit GHGs in order to develop and fully industrialize. Also, the per capita emissions are relatively low in these countries, although it can be argued that controlling population growth is another issue that should be dealt with through proper access to family planning and education. The affluent in these countries are often the biggest hurdle — because their corruption often stalls foreign aid and investment from reaching the poor who really need it. 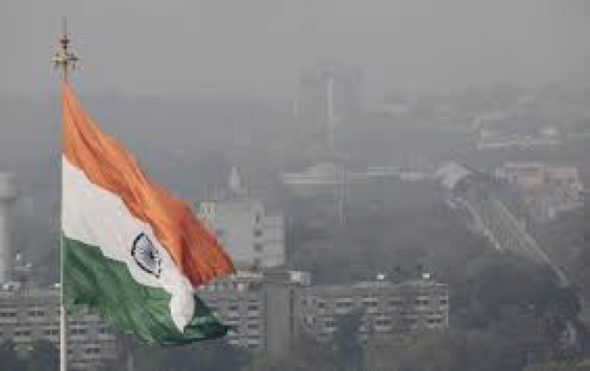 The Indian flag, the Bharat Chakra surrounded by the national colors, blows in smoggy wind. Climate change impacts, such as coastal erosion, rising sea levels, global warming, drought and desertification, and the harms from increased severity and frequency of extreme weather events has a disproportionately large impact on poor and minority communities around the world — those with the least resources to adapt and build resilience. Therefore, from the perspective of corrective and redistributive justice, the cost of adaptation should be borne by those who have committed the harm — those with the most resources who have also historically been the major emitters who have caused the 400 ppm of GHG in the atmosphere. This is not just the Global North countries, or the developed countries, but those people in the top 0.1% economically who have essentially managed to hoard most of the world’s resources, natural and otherwise. Women, children, the old, but also the poor are the first and worst impacted by climate change. Small islands, such as Tuvalu, Kiribati, are already losing land mass, which is a threat to their territorial integrity (along with self-governance, these are the two aspects to sovereignty itself), although their emissions and their GDP are low. Many people in the US, in Louisiana and New York, for example, died or lost their homes and livelihoods after Hurricane Katrina and Hurricane Sandy respectively, two storms which research shows were exacerbated by climate change. The US EPA defines Environmental Justice is the fair treatment and meaningful involvement of all people regardless of race, color, national origin, or income, with respect to the development, implementation, and enforcement of environmental laws, regulations, and policies. This should apply not just to communities in the US, but all over the world. Also, those in the US that are suffering from the adverse effects of pollution must stand in solidarity with those around the world who are being impacted first and worst by climate change. 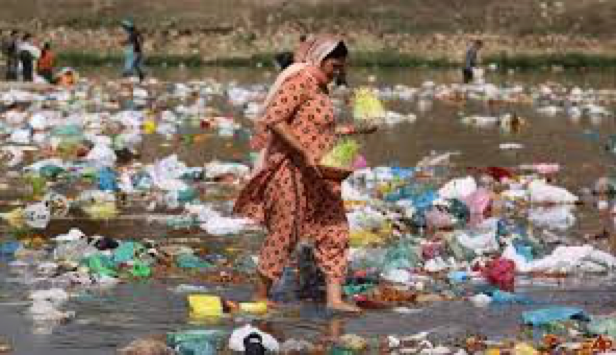 Indian woman struggles to navigate a trash filed waterway. This means that we must support those who need to build resilience by funding groundbreaking technologies that will allow the bottom 2 Billion people in the world to leapfrog over old dirty carbon based systems and have access to electricity, sanitation, health care, and education. Simultaneously those of us with the most resources must live more Gandhian lifestyles — changing patterns of production and consumption and being more climate conscious in our behaviors — avoiding factory farmed meat, refusing to buy electronics or jewelry that contains slave labor in its supply chain, and endorsing products and services that come from more thoughtful and sustainably oriented companies. Divestment is not just about what the big pension funds must do — each of us must have a divestment strategy. This is the only way to create true sustainable development that embodies inclusive growth for all. Sonali P. Chitre, Founder of WATER, is a climate change advocate and clean tech spokesperson. As a lawyer and strategic consultant, she has worked for over 5 years to bring green technologies and the creative financial solutions that enable them into India, the Middle East, and Africa. In 2013, she decided to start training millennial and teen women to become the next leaders of the climate change and new energy movement by teaching them policy advocacy, research, writing, lobbying, coalition building, and entrepreneurship. WATER’s members include diverse young women pursuing law, policy, business, strategy, science, and technology. WATER is always ready to accept new members to build a legion of climate change warriors.